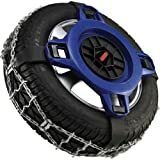 What is the best tire chains for snow and ice? That was the topic of a conversation between relatives and friends during last winter holidays. A friend of mine, a veteran truck driver, offered us all his experience to help us find the answer. What to consider, when choosing tire chains? What tire chains are the best? Do I need snow chains for all four tires? What are better snow chains or cables? Are snow chains bad for tires? How fast can you drive with chains on your tires? Conclusion. Choosing the best tire chains for snow and ice. It is important to know the snow chains types and their characteristics, to choose the ideal device for your needs. This is the best known; they are made of interlaced steel links. There are several models according to the pattern of the links on the tread. They usually go with one or two manual or automatic tensioners and work well on snow and ice and are durable and resistant. Its installation is usually cumbersome about other types of chains and they transmit vibrations through the direction and suspension. Likewise, the links can scratch the alloy rim or cause some damages if there is low clearance between the wheel and the internal components around it. Generally, they offer less traction compared to tire chains, that’s the reason why they’re preferably used by 4WD vehicles. They are suitable for vehicles with limited space between the tire and other internal parts because of their lower profile. They also produce much lower levels of noise and vibrations. On the other hand, they have a lower durability, and they are not suitable for daily use during long seasons. Composite chains are nets that cover both the rim and the tire. They have a rubber that fixes them to the rim and a net of links that cover the tire formed by plastic cables covered with textile material. They work fine on both snow and ice, they are quite durable and placing them is relatively easy. These chains allow a smooth driving since they hardly generate vibrations. The stability and traction control also works without problems. Its biggest drawbacks are their cost which can go from 80 to 120 dollars a pair and they’re not enough resistant to heavy-duty off-road conditions. They consist of a disc which is placed on the rim fixed to the screws of it, and the chain itself which can be like a caterpillar with rigid transverse bands. 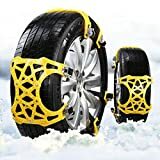 Their placement is very fast, they work very well on snow and ice, but they are also the most expensive on the market (about 480 dollars per pair). These chains are suitable for frequent use and in very adverse conditions. The size of the tire chain should be adjusted to the size of your tires. If the chains are very large, the necessary traction will be unachieved and the links could hit the suspension system and the brakes of your car. Otherwise, if the size is very small, the chains will not cover the wheel. Is your car suitable for chains? It depends on the clearance between the wheel and internal parts like suspension, undercarriage, and brakes. The owner’s manual or customer service of your car should provide specifications about it. It is also important to buy chains that can be installed quickly. Remember that in more than one occasion you will have to get out of your car to place them in the middle of the road under snow and freezing temperatures. The chains manufacturer should provide a good instruction manual that clearly explains how to fit them to the tires. You should be well informed about the terrain conditions which you will ride. This will influence the link pattern that your snow chains should have. If you will need driving on the ground, select a diagonal link. If durability and grip are important then take the chains with square links, and if you have to drive off-road ladder like links are the best choice. The best tire chains should keep on in their top condition through years even if it is used frequently, they should be unlikely to wear and tear. Otherwise, you will be spending money frequently, and your safety will be compromised. Before buying your new pair chains, make sure under what conditions they’re required or not by local authorities. In general, the transit authorities demand to take them in their vehicle when there are adverse weather conditions. Each state of the American union establishes its own norms. The rate of use is another aspect to contemplate. Maybe you just want to buy some tire chains to use them in a timely manner just to get out emergency situations. For those cases exists the emergency tire chains. They are more robust and are designed with a higher profile to get your car out of a stuck. If this is not your case, maybe you prefer to choose tire chains intended for daily use. You should not be tempted to choose a tire chain only on the basis of the price. Quality should prevail over the cost. Don’t forget it is about your security. Item Dimensions: 10.25 x 5.5 x 4.25 inches. This device is suitable for vehicles with off-road tires with more than a 40” girth. It’s constructed with tough and durable rubber. No risk of damage for your tires. Find more reviews on Amazon.com! Item Dimensions: 17 x 12.5 x 3.9 inches. High durability. It is constructed out of premium steel, steel studs, and aluminum alloy fastener. Easy to install and safe to use. It can be fitted in minutes, without the jack or without moving the car. The closing mechanism tends to break easily. Not for off-road terrains. Item Dimensions: 7 x 4 x 18 inches. Designed for cars with limited clearance around the drive tires. Fast and easy installation. You won’t have to move the vehicle to place them. You don’t have to stop and retighten after installation thanks to its rubber tensioners. Better traction performance than conventional tire chains or cables. Compatible with anti-lock brakes and other traction control systems. Tensioners can break so you should include extra tensioners in your buy. The connectors are harder to work with because of their low profile. Comes with a cloth bag sized properly to hold the cables. The biggest issue is this chains gets very close to the strut and the brakes on the inside of the wheel, so it’s important to install them correctly. Find more than 100 reviews on Amazon.com! Item Dimensions: 14 x 7.9 x 4.6 inches. Simple mounting and removal thanks to their low weight. Improves starting, stopping and cornering performance. Made by stainless steel for long durability. It’s very important to install them correctly to avoid to readjust them after place them. Check user manual. You should not go over 30 miles per hour. Intended for paved roads. Not for gravel because this type of surface quickly degrades metal links. They’re not heavy duty chains. They tend to produce slips when driving on uphill. Item Dimensions: 11.6 x 11.3 x 3 inches. Self-tightening ratchets offer automatic tightening and centering. Diamond pattern affords a smooth ride and great traction. Meet class ‘S’ clearance specifications. Accepted by most of the local transit authorities. Be sure which size fit your tires. Correct performance depends on it. They can damage the vehicle if they’re incorrectly fitted. Find customer reviews with photos on Amazon.com! 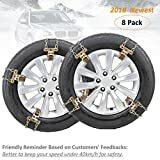 Fun-Driving 8 Pack Tire Chains,Snow Chains,Heavy-Duty,Durable and Adjustable,for SUV,Truck,RV, ATV, Tire Width 205-275mm/8-10.8"
Item Dimensions: The whole package measures 13.8 x 11.7 x 2.8 inches. Can be used in all weather and all type of terrain. They can be easily adjusted to the tires. They’re made from welded iron coated with Zinc to prevent rust. They’re appropriate for heavy duty and are more durable. Requires using the ratchet roll to tight and loose chains quickly. Ratchet roll is covered with a protective shell to avoid rim scratches. Installing the 8 chains may take some time. Item Dimensions: 12.5 x 9.4 x 6.5 inches. Provided with 4 easy to use cams to keep the chains tight on the wheels. Comes with the cam tool and step by step instructions for easy installation. It’s desirable to buy an extra chain tensioner to maximize performance. Provides optimal traction to your vehicle. Heavier than other types of tire chains. Item Dimensions: The package measures 26 x 25 x 9 inches. It has 4 traction arms made of resistant polymer materials with tungsten carbide studs embedded. Provide maximum traction in ice, snow and or mud covered roads even as deeper than 5″- 6″ deep. To be used on FWD, RWD, AWD cars, minivans, small SUVs and small pickups with tire widths of 235 mm or less. Suitable for use in hilly areas and on steep grades. Easy to install or remove in minutes. Its frequent use in mountainous areas and on steep slopes can break the plastic arms quickly. Find more easy-to-install Spiker-Spider chains on Amazon.com! Snow chains tend to provide better traction in general conditions. They are installed mainly on the vehicle’s driving wheels and are preferably used for 2WD vehicles. It depends on the clearance between interior side of the wheel and inner parts like suspension, undercarriage, and brakes. With snow chains you get better traction, but they’re right for cars with enough clearance. Snow cables need a lower space but they’re usually not so robust and offer a lower grip. If you choose the correct size for your tires, the right model for the type of road you will ride and install them properly, they shouldn’t cause any damage to your tires. You should never go more than 30 MPH when riding with any of these implements placed. This applies on any surface. 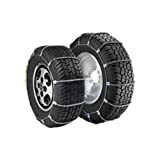 All the products shown above have great features, but definitely, the Peerless 0232405 Auto-Trac Light Truck / SUV Tire Traction Chains has won first place for the best tire chains for snow and ice. They offer the best performance about security, durability, fitting to the wheels, ease of installation and besides follow the regulations of the traffic authorities. Thanks to these tips my relatives and friends already know what they should buy for next winter holidays trips.